In .NET, Visual Basic’s syntax has gotten more efficient which makes the job easier. Visual Studio has gotten smarter: it assists you with a lot of mundane typing tasks. So once you get used to modern technology, going back to VBA or VB6 can be rather painful. So I’ve created this utility code to ease my sorrow, and hopefully help you out too! A lot of customers still like to get smaller solutions built in VBA. I do a lot of automation work with Visio, and customers like that they can get in and tweak the code without having to do a re-compile. At very worst, they can sick a summer intern on it. There’s a comfort in knowing that the consultant’s work isn’t buried in some .exe or .dll that nobody will know how to update. Fair enough. I figured, I would rather just type the variable names and data types once, then let some code automate the creation of the properties. 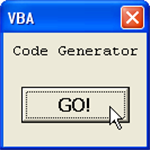 The VBA module that accompanies this article does just that. Then you run the code, and it creates the skeleton of a VBA class for you in the Debug (or Immediate) window! You can just copy and paste the output into a new class definition. Creates a ToString() function that serves as a text dump for you class. Be sure and read the comments that are written in this function! Note: this is the output code, not the source code! '//       cases, you will get errors in this function. '//       cases, you will get errors in this function. I have download the VBA but i don’t know how to install it. Should i copy the .bas file to certain folder? and how to run this VBA module. Usually you can import .BAS files into a VBA project. This is the PropertyList$ near the beginning of the code. Then you simply run Sub VbaPropertyGenerator(). Your class will be output to the immediate (Debug) window. I Think you should add Date to the NativeTypes though. awesome tool! sick of writing properties! Thanks for this! Thanks for this! Please consider adding Date to the list of native types. I followed directions, was able to import to access. However, when I invoke this procedure I keep getting run-time error 40192 (application-defines or object-defined error). Looking into intermediate window I see where the tostring is failing around property in middle of list of defined properties. Any suggestions appreciated.